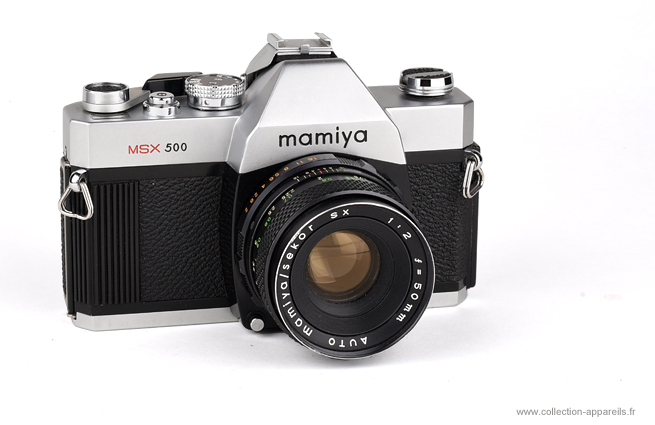 This reflex camera has a shutter ranging from 1 / 500th to 1 sec + B. It is obviously the maximum speed that determines the name of the model. There is also a model reaching the thousandth of a second, called MSX 1000. The other specifications remain the same between the two models. There are 2 coaxial connections for flash sync but the flash shoe is an additional accessory attached to the viewfinder. lens mount is a 42 mm screw type with a small specialty: A small lug moves into the lens slot to lock it in rotation. So do not forget to press the chrome button below the lens before attempting to unscrew it.